Electric Mobility Canada (EMC) is pleased to announce its Sixth Annual Student Competition open to Undergraduate Engineering and Business Administration Student Teams from Canadian Universities and Colleges. The competition will be held on site or via video conference on May 31, 2017 @ 9:00AM in Markham, ON. The winning team will receive a public FLO charging station to be installed on their campus. Teams will be asked to present an electric vehicle (EV) issue to resolve. The issue will have both technical and economic elements related to ‘Smart e-Mobility’ which is the theme of EV2017VÉ to be held May 29-June 1, 2017 in Markham, Ontario. Participants will have 45 days to assess the issue, conduct research, and devise action for adoption in Canada. Each team is to prepare a 10-minute presentation of their solution and plan for adoption. Teams wishing to participate are to register by e-mail as described below by APRIL 7, 2017. Five teams will be selected to participate in this year’s event. All teams will be notified by e-mail of the selected participants and will received the problematic to be solved by APRIL 14, 2017. Each team’s response will be due on May 30, 2017 at 4:00PM Eastern Standard Time. The document can be either written (Word file) or a combination of written and visual (PowerPoint file using speakers’ notes). The 10-minute presentations from each team, either on site at the conference or via video conference, will take place at the Hilton-Toronto, Markham in Markham, ON on May 31, 2017 at 9:00AM. An adjudication panel comprised of EV industry representatives will judge the presentations. The panel expects to address one specific question to each of the participating teams. The adjudication panel will evaluate the presentations, determine the winning team in the competition and provide feedback to the participating teams. The competition results will be announced as part of the EV2017VÉ Awards Luncheon on May 31, 2017 at noon in Markham, ON. This competition is open to undergraduate students enrolled during 2017 in a Canadian university or college engineering and business administration program. There is no cost to enter. The presentations must be done in English. 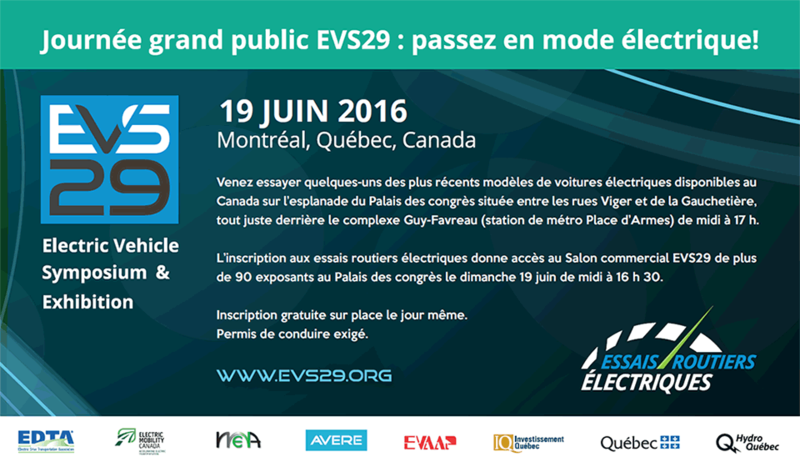 Please register by APRIL 7, 2017 by emailing Marie-Andrée Emond from Electric Mobility Canada, at m.a.emond@emc-mec.ca. Visit our website to learn more about EV2017VÉ Conference & Trade Show.